While not exactly about golf in Thailand, I thought you would want to know about this new Vietnam golf course. Today, The Montgomerie Links Vietnam broke ground on the clubhouse near the storied sands of China Beach. This destination is already part of our Vietnam Golf Trail tour, so once opened, it is sure to add a great day of golf to the already action packed trip. The Montgomerie Links Vietnam is the only Colin Montgomerie-designed and branded course in Vietnam or Thailand. Located just off famed China Beach and minutes from Da Nang’s international airport, The Montgomerie Links Vietnam has been routed to capitalize on its close proximity to both the warm, tranquil South China Sea and striking Marble Mountains — which are clearly visible from various points on the course. The golf course plays over a striking landscape of wispy casuarina pines and sand dunes and includes an exciting mixture of wooded and links style holes which will cater to players of all abilities. Eight-time European Tour Order of Merit winner Colin Montgomerie—better known as Monty to his worldwide fan base—is using massive greens and rippled fairways with a stunning backdrop, setting up an experience that will be as good as any of the other top rated Vietnam golf courses. Those familiar with Monty’s growing portfolio of his exclusive and high quality personally branded designs, will recognize The Montgomerie trademark from his flagship courses in Dubai, Ireland and Wales. Vietnam will now be included in this premier list of golfing destinations. The first nine holes are expected to be playable by summer and when all 18 holes are fully finished later this year, it will be among Vietnam’s finest golf experiences, joining the likes of Dalat Golf Club and the Nick Faldo inspired Ocean Dunes Golf Club. 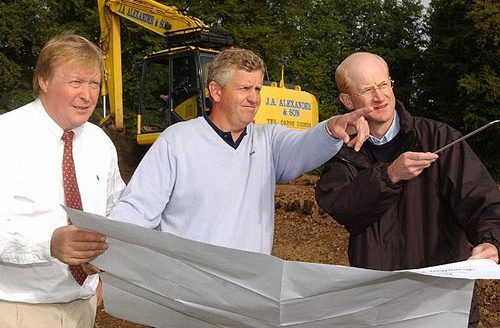 By the way does anyone know where the next Montgomerie Links is planned? Well none other than Krabi, Thailand! That is right soon the up and coming Krabi province will have its own international standard golf course, stay tuned!